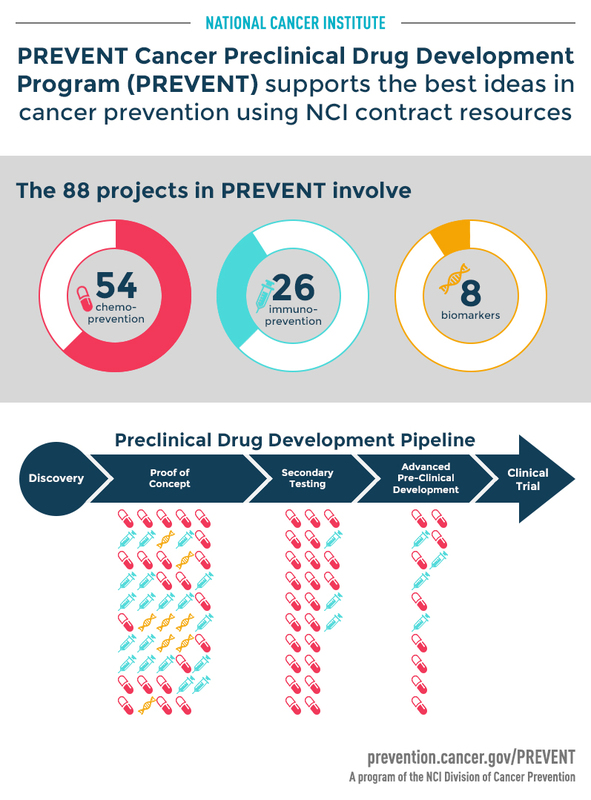 PREVENT is a peer-reviewed program designed to support development of the best ideas in cancer prevention using NCI contract resources. The program is a pipeline that focuses on unmet needs in prevention that are not adequately addressed by the private sector. NCI will actively partner with successful applicant to help them move their novel cancer preventive chemical or biological agents (singly or in combination) and biomarkers from the lab bench towards IND filing, proof-of principle clinical testing and registration or validation. PREVENT is a flexible entry-point system. Agents and markers at any point in the path from discovery to clinical trial will be considered for support. PREVENT is NOT a grant program. Instead, successful applicants are provided resources from NCI-funded contractors to carry out the necessary next steps of research. All results or products are returned to applicant and used to support further development by the applicant or in partnership with DCP.